Uncategories Final debate is tonight, but who won the first one? Final debate is tonight, but who won the first one? Tonight is the last televised debate between the leaders of the major parties in Ontario. Given the state of the race (a close contest between the Tories and the NDP) and the fact debates are usually major campaign events, it goes without saying that the stakes are high for Doug Ford and Andrea Horwath. They could literally win or lose the job of next Premier of Ontario tonight. For the Liberals of Kathleen Wynne, the objective should be to avoid a complete collapse. Speaking of which, the Sunday update to the projections is here below. No poll published yesterday (well except the updated Mainstreet tracker) but a couple of riding polls have generates adjustments large enough to change a couple of seats. Toronto Centre for instance is now projected NDP. As you can see, the Liberals are at only 4 seats! The chances they'll win zero are only 1.2% though. 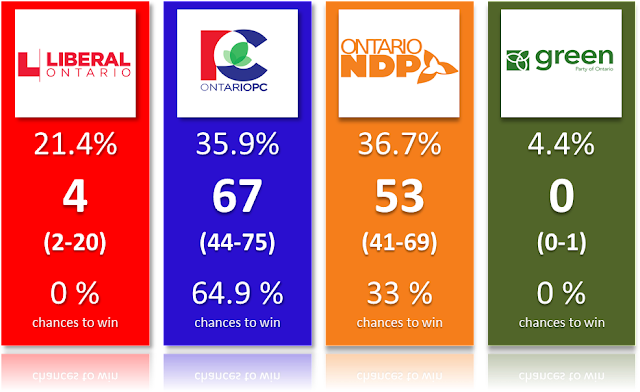 Still, think about it: there is a non-zero chance that the current majority party in Ontario (the party that has been in power since 2003! and has won 4 elections in a row) could be wiped out completely! The riding by riding projections are available at the bottom of this article. Ok, so tonight is the debate at 6:30pm EST. For Ford, this is the opportunity for him to finally show a good campaign (this isn't my subjective opinion talking here, polls clearly show that voters don't think Ford has done a good campaign or that he showed them reasons to vote for him) and rebound after losing the lead (in the popular vote). For Horwath, this is most likely the best opportunity for her to get the extra votes she needs to become Premier. It'll be interesting to see if she decides to go after the PC or the Liberals more. This isn't the first debate however. There was one at the very beginning of this election, on May 7th in Toronto. Who won this one? I haven't actually tried to answer this question yet because I was still on vacation when this debate aired. We mostly have two polls with data about this specific question. The first one, from Mainstreet, showed that 35% of Toronto residents thought Ford won, while 24% thought it was Horwath and only 19.3% for Wynne. 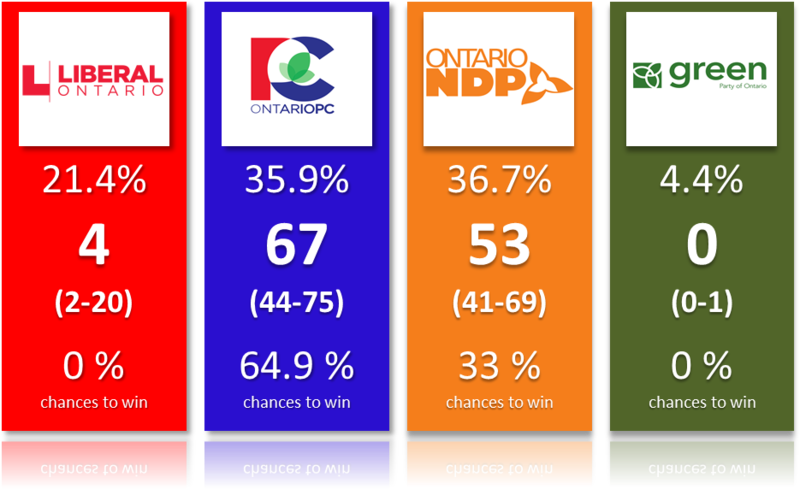 The second poll, from Innovative and conducted province-wide, had Horwath as the winner for 45% of respondents. Ford was 2nd with 25% while Wynne was 3rd again at 19%. The two polls aren't directly comparable since one surveyed Toronto only while the other one was province wide. Still, they both agree Kathleen Wynne finished 3rd. I always create a debate index to determine the possible impact of the debates. The idea is to remove (some of) the bias of the voters. Namely, if you are currently a Liberal voter, chances are you'll be a lot more likely to think Wynne did the best job. The Innovative poll actually proved that it was indeed the case on page 45 of the pdf. To create the index, I do the ratio of the % of people who thought a candidate won over the % of people voting for that party. A ratio of 1 means you convinced the people who already liked you. A ratio above 1 means there are voters from the other parties who think you did the best job. By experience, this index has worked pretty well in predicting future changes in voting intentions (it worked in Quebec in 2014 and BC in 2017). A ratio above 1 usually means your party will improve in the polls in the next week. Hindsight is always 20/20 but in this case, it seems the first debate would clearly have predicted a decrease of the Liberals and an increase for the NDP. Exactly what happened. We'll have to wait and see for the post-debate polls tomorrow to be able to recalculate this index for the second debate. Hopefully pollsters do ask this question.